- The air is clear today. Even though much cleaning up and rebuilding of homes and lives remains, it is wonderful to have clean air and a cool breeze. - Despite a devastating O.T. loss last night, the Broncos are still better than the Rams and Dolphins! - After a crazy busy month, this week is somewhat slow. - This weekend we have our first-ever small group Fall retreat. It's a 24 hour relationship-building extravaganza that should be really fun. - Hilarious, but subtle, line from The Office: The tag line at the end of Michael's commercial: "Endless paper in a paperless society." - I've decided Don Cheadle may be my favorite actor. It seems like he's fantastic in every role he plays. -Just spent much of the weekend teaching about Moses. What a life he led. - The newest onslaught of spam in my inbox is trying to sell me exotic watches. I don't get it. Taffy, our student ministries worship pastor, taught this weekend and was, as always, a big hit with the students. His energy is off the charts which makes for fun lessons whenever he's teaching. The band was led by our high schoolers which is a nice change of pace once in a while. However, even though the quality goes up when they lead, I would always rather see junior highers leading! I rarely accept invitations to speak to junior highers at camps, retreats, etc. but decided to bend that rule a bit this Fall. This weekend, (Fri-Sat) I'm speaking at my first of three Jr. High Believe events. Jr. High Believe is a 'junior high only' tour that heads into about a dozen cities. 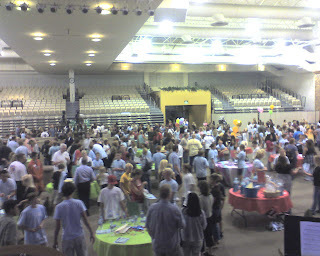 I attended a Believe event a few years ago and was really impressed with their commitment to trying to put on an event geard specifically to young teens. At the time, they had bigger name speakers...people who do big stage stuff for a living. However, the speakers weren't necessarily junior high friendly. Since then, they've made the decision to invite more speakers who speak to junior highers on a regular basis. That's where I came in. Other cities will have Jason Raitz and Scott Rubin (both from the junior high ministry at Willow Creek). This switch combined with the fact that I really like the Believe director, Johny Scott, made it feel like a fit for me. It will be interesting to hear how the Believe team feels about the trade-off. Junior high pastors who aren't professional speakers Vs. Professional speakers who aren't junior high pastors. I've mentioned it before, but since December 1st is about 5 weeks away, I figure it would be a great time for another shout out. Hoops of Hope was started by Austin Gutwein when he was 10 years old. Austin is the son of one of my best buddies, Dan. Austin is now in 8th grade and Hoops of Hope is stronger than ever with several thousand students participating each year. - Hoops of Hope raises money for kids who have been orphaned by HIV/AIDS. Specifically children in Africa. - Your youth group kids get sponsored by friends and family to shoot 1,000 free throws on Saturday, December 1st (World Aids Day). If two kids are rotating at a hoop and taking turns shagging for each other it's about a 4 hour event. - All you have to do is secure a local gymnasium or school yard or pull together a few portable baskets. - 100% of the money goes directly to help kids. Last year, Hoops of Hope was able to build a school in Africa! If you're interested. visit their website. They do all the work for you...they'll set up a web page for each of your students so their sponsors can donate online. I've never seen an easier way to get junior highers involved in something that makes a difference. The picture above was taken last week. World Vision took Austin and his dad to Zambia. The people in this region had never even SEEN a basketball. Austin (in the middle of the crowd in orange shirt)took the first-ever free throw and shared what he hopes his efforts will help accomplish. AMAZING. The air quality the past couple days has been really bad due to the fires. When you step foot out of your house it smells like a massive fire pit complete with ashes swirling about. In fact, much to the delight of children everywhere, school has been cancelled today due to the nasty air. Yesterday I was sitting in Starbucks and witnessed a fantastic Kodak moment. Walking side by side up to the doors were two people who weren't with each other. The first was wearing a mask/filter device over his mouth. The second was puffing on a cigarette. Classic. I wanted to shout out to the smoker: "Hey lady, toss the cigarette and just breath deeply...save yourself a few bucks today." I've been spending quite a bit of my quite/reflection time lately pondering my sin nature. Why, as Paul states, I often find myself doing those things I don't want to do and unable to do those things I want to do. How is it that the ugly side of me seems to always come out naturally despite some of my best efforts otherwise? I have lots of ugly parts, but it may be that the ugliest part of me is my self-absorption. I like being me. In fact I LOVE being me, and the rest of the world should like me as much as I do and behave accordingly! I'm painfully aware of my situation and have been taking strides to allow God to do some heart surgery. While some people may write off 'little sins' or small incidents as nothing to worry about, I somehow get bothered by those the most. I have pretty much figured out how not to let my self- absorption manifest in big ways. But the little ways are just as ugly and the remind me that my sin nature isn't going away any time soon. The fires in our area of been pretty intense for the past couple of days. Several of our friends have been evacuated, our church has been set up as a fire-relief station and as a staging area for fire fighters. Last night when I turned onto my street the flames were very visible in the not-too-distance. Ashes were falling from the sky and my kids were anxious. I spent about 30 minutes this morning watching the news and praying for the whole situation. Then I headed out to my favorite 'hole in the wall' coffee shop to do some writing and lesson prep. When I walked to the door, I was greeted by a little note saying that due to the fires and smoke the coffee shop would be closed for a few days. I WAS TICKED! Why in the heck would a little smoke cause them to close? Don't they know how badly I wanted to tuck away and work? Now I have to be inconvenienced by heading to Starbucks who, by the way, would never think of closing it's doors! Ugly me. Stupid me. Selfish me. It's the little things, our first responses to simple situations that often reveal the ugliest parts of our self. Returned from a great weekend away at Y.S. and now I'm about to sit in an all day executive meeting with the church team. Back to the real world! I spent this weekend at the Y.S. Convention, woke up super early this morning to drive back to the O.C. So instead of my usual weekend wrap up from my ministry I'll wrap up some of my experiences this weekend. General Sessions: I really enjoyed the general sessions this year. I think it was primarily because the subject matter of the speakers hit me a bit more personally than usual. I'm a Doug Fields fan, and I get to hear him teach quite a bit, but his message on envy was perhaps the best I've heard from him in a long time. Not sure anybody in the crowd could say 'not me' to what God was saying through him. Workshops: I sat in some and I taught some. According to the Y.S team, the workshops this year were some of the lowest attended ever. They attribute it to the fact that the conference is in San Diego and the weather was amazing....probably some truth to that. My buddy, Phil Shinners attended a workshop that rocked his world. I don't know the title of the workshop or who taught it, but I'll do some research and post about it in the future, but the premise was this: We've all been taught and probably believe the LIE that we can change the methods without changing the message when in fact every time you change the method you do, in fact, change the message. Really interesting....and a pretty strong statement that, according to Phil, he backed up well. People: Lots and lots of youth workers and lots and lots of opportunities to connect with old friends. I got to spend some time with two youth pastors who used to be volunteers in my ministry and are now serving the local church full time. Really fun to hear how God is using them. Middle School Youth Workers: Always my favorite group of people to be around! The workshops were fun and energetic. Last night a small group of about 13 of us went to dinner together and had a blast. Wow. I saw a portion of this story on the news this morning and found the article here. I haven't served on jury duty in about a decade, and have managed to postpone my last 3 or 4 summons, but not this week...which, of course, is an absolutely terrible week to have jury duty. Instead of being asked to report one morning to see if you are assigned a case, I have to call EVERY morning at 11:00 to see if I have to report that same day by noon. If not, I have to repeat the process the next morning. If, after a week of this process I haven't been called in, I have served my civic duty. It has made planning my week virtually impossible...everything is 'tentative' due to the fact that I may find myself driving to Santa Anna on a moment's notice. As I was whining about it, I find myself thinking that If I should ever find myself on trial(falsely accused, of course)I sure hope I have a jury of people who aren't totally ticked about serving and take their service seriously...so I will do the same if called (hand on my heart as I make that pledge). We wrapped up our series with a lesson dealing with forgiveness...the ultimate conflict killer. Week two of 'Choctober' include our chocolate slip n slide down the center isle and free chocolate blendeds for all visitors. All in all a pretty good weekend. I read very little fiction. About the only fiction I read is John Grisham stuff. So when I was in the bookstore last night and saw his new book, Playing For Pizza, I grabbed it. 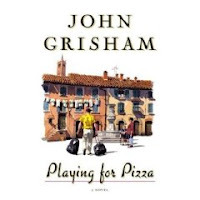 Playing For Pizza is a football story and one that I liked quite a bit (It's a short novel and finished reading it this morning...). It follows a year in the life of a down and out NFL quarterback who finds a fresh start in a small Italian football league. If you are a Grisham reader because you like legal drama, don't buy this book. It's nothing deep....just a fun read if you're a sports fan. - Best quote from the Office this season: "I'm not super stitious, but I am a little stitious". - Second Best: "There's about to be a whole lot of stupid up in here!" - I found a GREAT coffee shop about two miles from the church yesterday. I'd heard of it before, but had never been there. It's big, empty, with a super cool atmosphere and vibe. I spent 10 hours there writing 5 small group lessons, editing 4 others and working on a weekend message. - Next week, I have to write 5 lessons on the life of Moses....I've never taught on him before (other than 10 commandments or quick overview), so I'm a little apprehensive. - Anybody going to Y.S. in San Diego next weekend? Maybe a dinner gathering of JH workers? - Today I was given my very own hard hat so I can walk around our Student Zone job site whenever I want. When I commented that it didn't look super sturdy the response was: "These are really just for looks to please the insurance company. Anything that hits your head hard enough to kill you will kill you even if you have a hard hat. " Not real comforting. - Funny that we're teaching a three-week series on the proper way to handle conflict. I am an avoider of conflict and when I find myself in it, I rarely handle it properly. I'm doing most of the teaching, but may be doing most of the learning, too. Simply Youth Ministry is putting together a catalog dedicated completely to junior high resources and they're looking for fun pictures of junior high ministry in action. My friend, Kerry Mackey, hosts a weekly podcast for church leaders. I am his guest this week as we talk about a different approach to implementing the purpose-driven paradigm in a youth ministry setting. You can listen to it here. Also, be sure to check back in a couple of weeks when his guest is Matt Casper; co-author of Jim and Casper Go to Church. An incident last night reminded me that it's been quite a while since I posted a 'junior high ministry 101' thought. Yesterday afternoon my 10-year-old son, Cole was wrapping up football practice. I had started to put my junk in the car and wasn't paying much attention to what was happening on the field, but when Cole came to the car he was upset...his eyes were watering and he was complaining that some of the guys on the team were taking cheap shots etc. Being the caring dad that I am I said something like: "It's football...shake it off". That was the end of it. A few hours later as a house full of us were watching Monday Night Football, I got a phone call from Cole's coach. He said he had noticed Cole was upset when he headed to the car and wanted to check on him. We talked for a few minutes and during that time the coach shared a ton of super encouraging words about Cole and also a few observations that he thought could help Cole on the field and with his relationships with the team. At the end of the conversation I thanked him for the call. The fact that he even noticed Cole was upset was big...him calling later on to talk to mom or dad about it was HUGE. A few of the people watching football with me also work with junior highers and we took a second to talk about the power and importance of communicating with the parents of our students. Almost all of the parents in your ministry REALLY love their kids and are super thankful you are playing a role in their life. Your words of encouragement, sharing things you've observed, keeping them in the loop etc. may be the simplest, yet most valuable, thing you do. It took the coach 5 minutes of his time, but he has won me over. I trust him with my son more, I respect him as a coach more, and I respect him as a person more because he made the effort to talk to me. Took the weekend off to go with to the desert with a group from church. There were 32 families in a massive circle of RVs, dirt bikes, quads and sand rails. We had a great time and the 'church service' around the camp fire on Saturday night was fantastic. A crew from our Children's and Student teams went to Catalyst last week. For most of them, it was their first time. The majority said it was the best conference they've been to. I have yet to go. For some reason, there always seems to be a conflict in my schedule. Our junior high services went well. We are in our second week of our three week conflict series, 'Get Out Of My Face'. That, combined with week one of Choctober combined for a fun weekend. I'm heading into what feels like my busiest season in a long time for 'producing' stuff. I need to write discussion questions for about 6 small group lessons, write 5 messages for a junior high conference, write 2 youth specialties workshops and complete a few other significant church-wide projects all in the next two weeks. yikes. Today we are shooting videos for 'Choctober'. Every October for the past several years we turn octocter into choctober and build the majority of our programming around chocolate. Chocolate games, chocolate prizes etc. This year, three of us from three different churches are filming videos together that we can show in our junior high ministries. Dumb, chocolate themed contests that will most likely end in some horrific amount of chocolate being consumed, thrown or dumped on us. There certainly are a lot of intriguing reasons for it. In a previous post, I mentioned that last night was our annual Small Group Meet N Greet. We started this tradition a few years ago in the hopes that, because all of our small groups meet off site, we could provide a formal opportunity for parents to meet our leaders and each other at the church campus a week before groups started meeting in homes. We had become surprised at how many of our leaders mentioned they were having a hard time meeting the parents because they'd pull up to the house, slow down to about 10 miles an hour and shove their kid out the door. We thought the Meet N Greet would help our leaders meet each parent and put a parental 'face' to each student. It has proven more successful than we ever imagined. At the meet n greet, students find out what group they've been assigned to (most already know because they've been called ahead of time by their leader), they get their student notebooks, their C-group t-shirt, maps to the host home etc. We typically have almost 100% attendance. I took this picture of part of our worship center from the stage. It was a great night and we were able to meet a ton of parents. I was really excited about this series heading into it, and I think the first week went well. I used week one to set up the issue of conflict and talked about the reality that most people don't handle it well. I set the stage for next week's lesson on how to properly deal with it. We seem to be having fewer and fewer weekend volunteers showing up which is disturbing. Not sure if they are easing back into the Fall or if we've simply managed to lose a few. It's definitely something we need to take a closer look into. Music was 'average' not because of quality, but because of who was leading. Once every couple of months, we have an all student band of high schoolers leading in Junior High. I love giving them the opportunity, and they do a great job. It's just that I hate not having junior highers leading music! But it is fun to see the older students come and 'give back' to our ministry.